This one-page document describes CPC Learning Network's Global Classroom. Through this initiative, students at Columbia University and NGO child protection practitioners learned from each other by holding virtual classrooms. 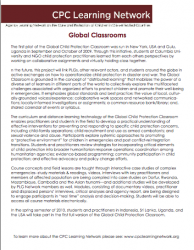 The first pilot of the Global Child Protection Classroom was run in New York, USA and Gulu, Uganda in September and October of 2009. Through this initiative, students at Columbia University and NGO child protection practitioners learned from each others perspectives by working on collaborative assignments and virtually holding class together.